I suffered from mental anorexia for a long time. My dialogues with people lacked depth. They were superficial. Dull. A few social diseases that caused my illness are television, socializing, or just laziness. Thus, I have spent a good amount of the past four years recovering from this infection. Knowledge has become my narcotic, taken by reading. I feel happy writing this blog for a few reasons. First, it marks the 100th blog milestone of my journey. It was three years ago when I started to share stories from my real life with a proposition: This is who I am. This is my life. This is what I went through. And maybe you can learn something from it. Second, I published a blog titled “400,000 Pages in Baghdad” last December about my mental journey of reading 100 books in 2014. At the end of that year, I recommended one book. I selected only ONE in the hope of increasing the level of awareness – especially with Americans- about some issues that are near and dear to my heart. I would like to repeat that this year perhaps begin a tradition of sharing my selection for the book of the year. I couldn’t read 100 books though, not this year, I read only 63, because I took two one-month vacations to visit Malta and Italy. Those vacations left me with ten months to read. Yes, I do have a full time job, and I am a dedicated gym attendee. But before sharing my recommendation for this year, I would like in the next few paragraphs to explain how I select the books. My primary source is Nassim Nicholas Taleb. I try religiously to also read books recommended or mentioned by him. His numinous books should be read many times. My secondary sources are a few newsletters of authors I follow such as Tim Ferriss, Ryan Holiday, Maria Popova. However, I feel some of their recommendations of books are meant for the privileged rich westerners. Some books are written for a class of people who are abstracted from life’s reality and live in a bubble of their imagination. And when I discover such a book after buying and reading a little bit, I ignore it – just a way of insulting it. This year I read many great books such as: “The Glass Castle” by Jeannette Walls, “Winter is Coming” by Garry Kasparov and “Status Anxiety” by Alain de Botton. But there is only one book at the top of the list. And once again, I feel obligated to increase awareness about an important issue – this time it’s intellectual freedom. 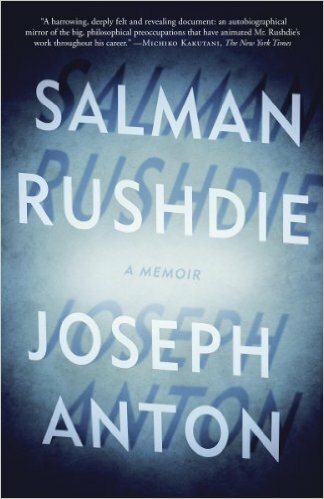 And the book of the year 2015 is Joseph Anton by Salman Rushdie. It is a story of a man who lived handcuffed by a Fatwa on one hand and a Jihad on the other. A Fatwa issued by the Iranian Ayatollah Khomeini for writing his novel “The Satanic Verses”. Joseph Anton expresses an epic battle against the tyranny of the dark ages for his intellectual freedom. He went into hiding from years in fear of being killed by the radical Muslims. I had been living in Iraq when the controversy started back in 1989. His book was banned across the Arab world, Iran, India and a few other countries. The most interesting part of his story is how America, the United Kingdom, and Europe dithered and cried foul against Iran for his right as a British citizen to publish a novel on that subject. Thanks to the invention of the Internet and the e-book technology that has no borders, 27 years later, I am reading his novel in Iraq. I hope they publish a graphic novel or produce a movie version. I will support such a project on crowdfunding platforms such as Kickstarter with alacrity. I have great admiration for people like Salman Rushdie, Christopher Hitchens, Kurt Westergaard, and Geert Wilders. Their names will go down in history for their stands on intellectual freedom. Lastly, I train every day to resist the “busy-ness” syndrome of excessive socializing and the temptations of Facebook, YouTube, and Netflix. For those who are interested to see the list of all the books I read, everything is on the Pinterest 2015 Books board. Whenever possible, I included who recommended it. * Click on “Follow” from the lower left corner to follow the story.